In an era when SUV sales are making all the news and even Ford is cutting passenger cars from its lineup, reviewing a full-size sedan could seem almost pointless. 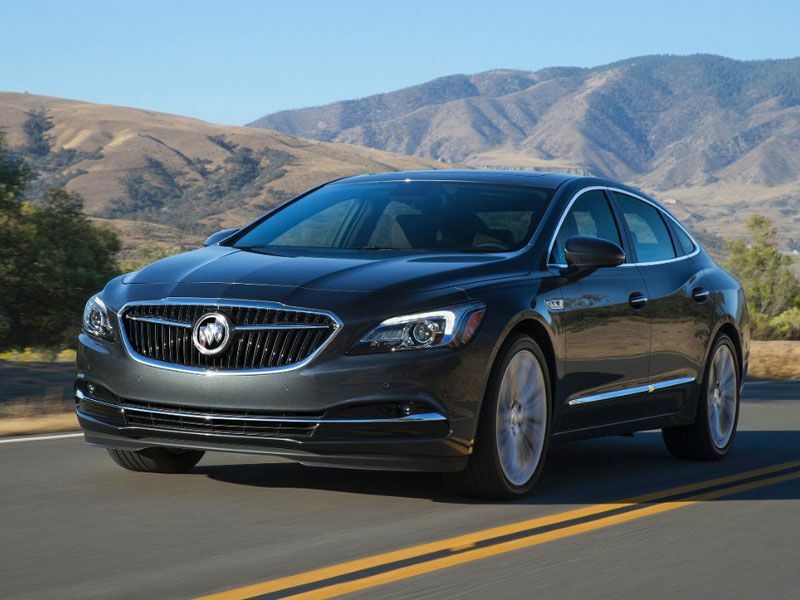 But there’s still a place in the market for a car like the Buick LaCrosse, and with Ford announcing their departure from the family car market there are more buyers who might consider a Buick this year. The LaCrosse was refreshed for the 2017 model year, so it’s still new and has the latest features. 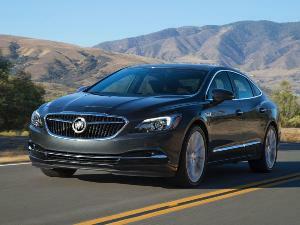 Buick announced sales of 20,161 LaCrosse sedans last year, making a strong showing in the market. For 2018, the LaCrosse remains mostly unchanged. 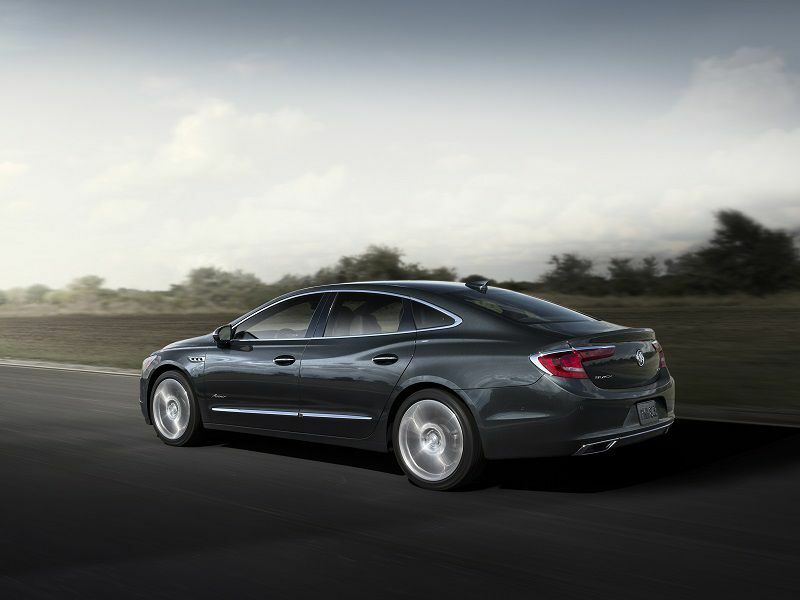 What you need to know is this: the Buick LaCrosse is a full-size American luxury sedan available at an economy sedan price. If that’s what you want, LaCrosse is a solid choice. The 2018 LaCrosse is the pride of Buick’s passenger car lineup, showcasing Buick’s status as GM’s near-luxury brand. 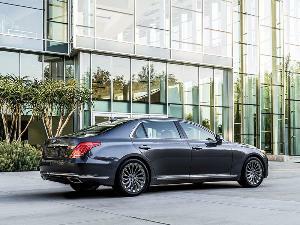 LaCrosse also undercuts the luxury marques on price while offering a first class experience. The 2018 LaCrosse is a full-size four-door sedan available with front-wheel-drive or all-wheel-drive in up to five different trim levels, including the top Avenir edition. The sticker price for a new LaCrosse ranges from $30,490 up to $47,995, including all required fees. 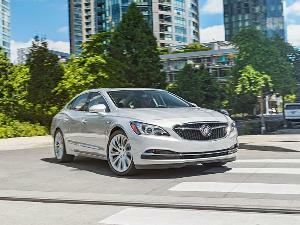 At press time, Buick is offering $750 cash allowance on all trims except the base model. 2018 brings a new standard engine for most LaCrosse trims. 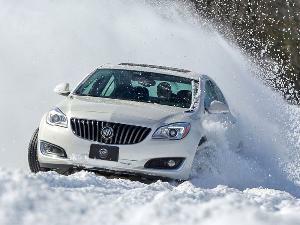 Buick’s 2.5-liter four-cylinder has been enhanced with an eAssist electric motor to make a mild hybrid. The electric motor helps add torque when the LaCrosse moves away from a stop. The system also allows the LaCrosse to harvest braking energy to charge its battery and provides a smooth engine start-stop function to save fuel. The 2.5-liter eAssist engine delivers 194 horsepower and 187 pound-feet of torque to the front wheels. A 6-speed automatic transmission is standard. With this combination, the LaCrosse returns EPA-estimated fuel economy of 25 MPG in city driving and 35 MPG on the highway. 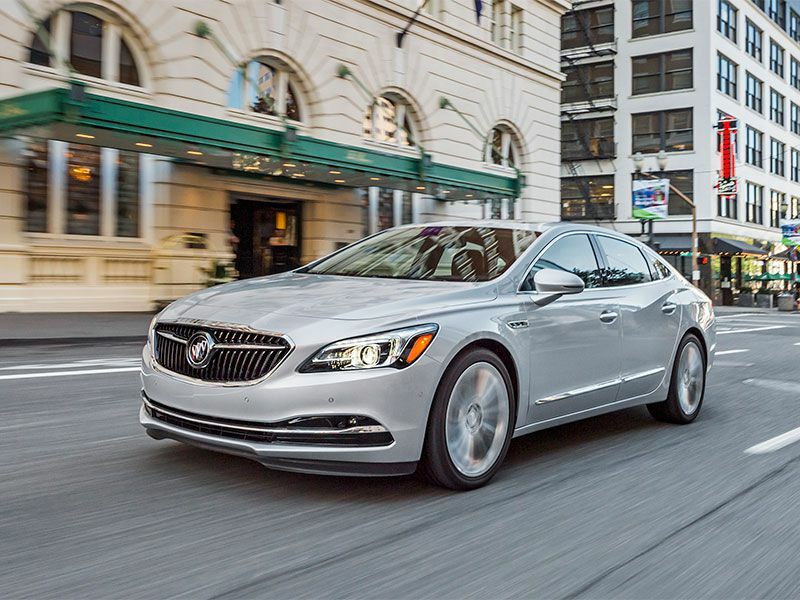 Most trim levels of the LaCrosse can be configured with Buick’s popular 3.6-liter V6, rated at 310 horsepower and 268 pound-feet of torque. This engine comes with a 9-speed automatic transmission for maximum performance. The LaCrosse V6 is available with buyer’s choice of front-wheel or all-wheel-drive. The V6 and front-wheel-drive is available at all trim levels except the base, and all-wheel-drive is available with the top three Essence, Premium, and Avenir trims. With the V6 and front-wheel-drive, the LaCrosse returns 21 MPG city and 30 MPG highway, and 20/29 when equipped with AWD. 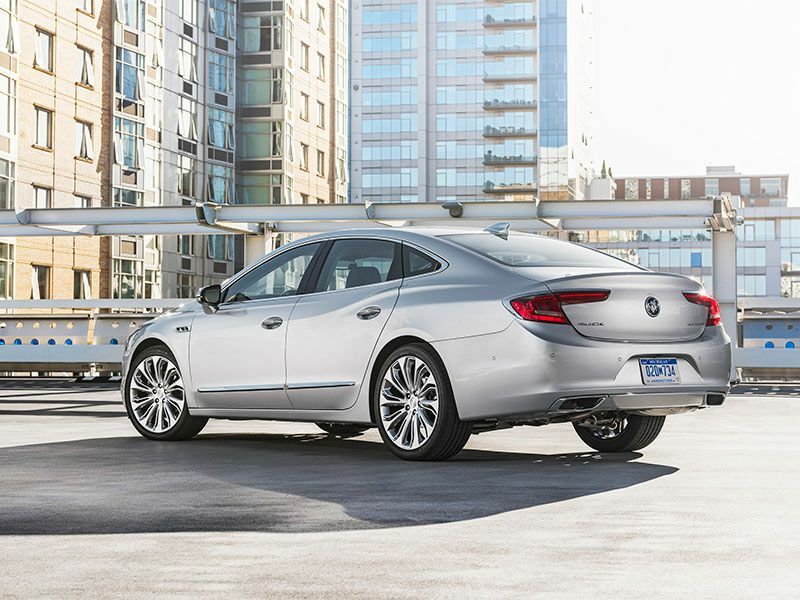 The 2018 Buick LaCrosse is an attractive and dignified car, but it won’t really stand out from the crowd. Thankfully, Buick has not attempted to hide the essential nature of the LaCrosse behind overwrought styling or an abnormally large grille. This is a car for adults who don’t need to show off but still want to look good. The LaCrosse does not try to be anything but what it is. The LaCrosse looks more expensive than it really is, and Buick’s designers have made sure that your eye will follow the flowing sidelines. 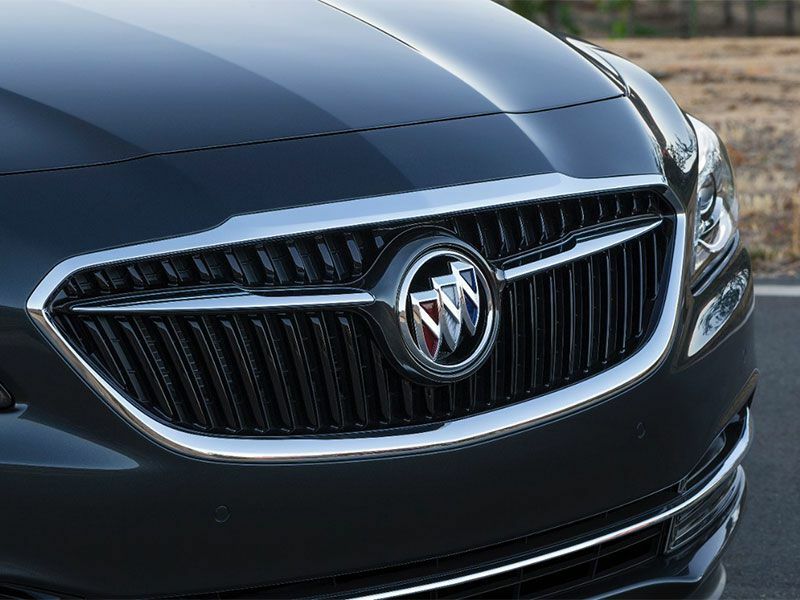 The grille and headlights complement each other, and Buick placed their trademark Ventiports on the fenders. 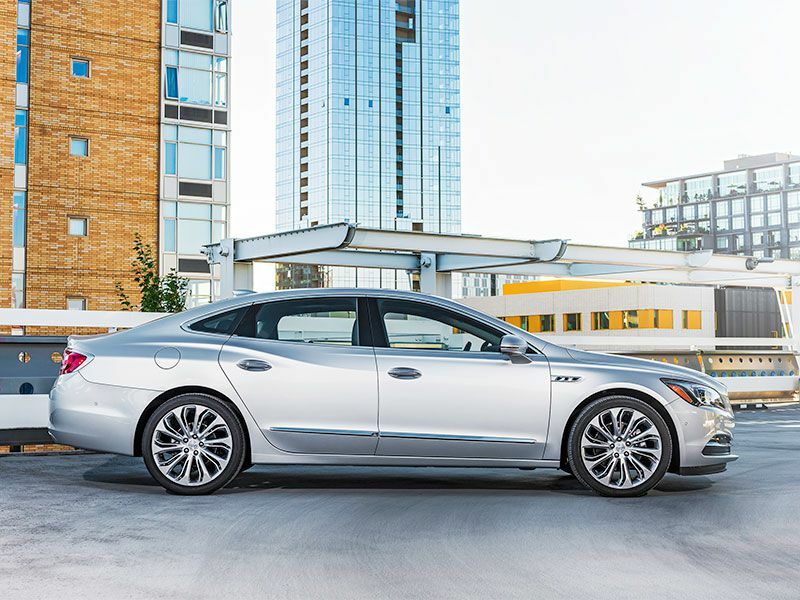 Standard 18-inch alloy wheels on most trims and 19-inch wheels on the Avenir give every LaCrosse a modern and premium stance. 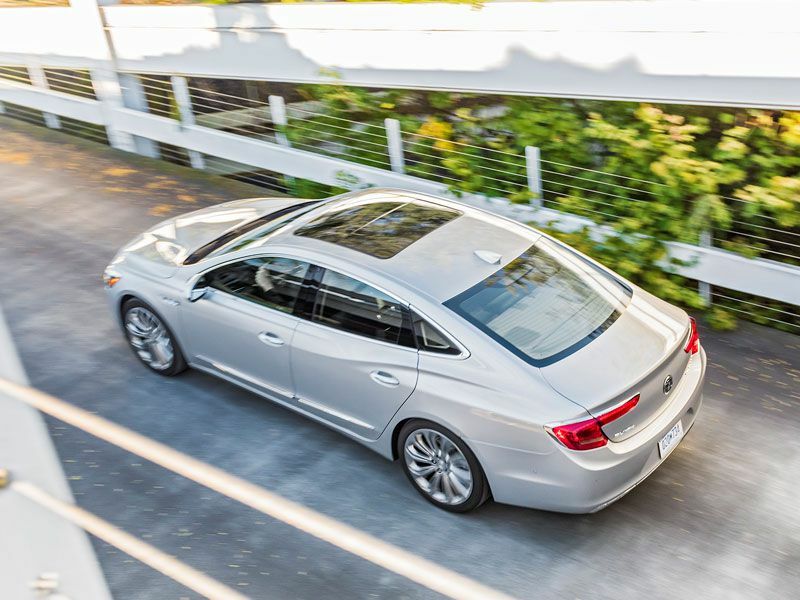 The point of a luxury car is mostly in the interior, and this is where Buick sets the LaCrosse apart from competitors in its price range. 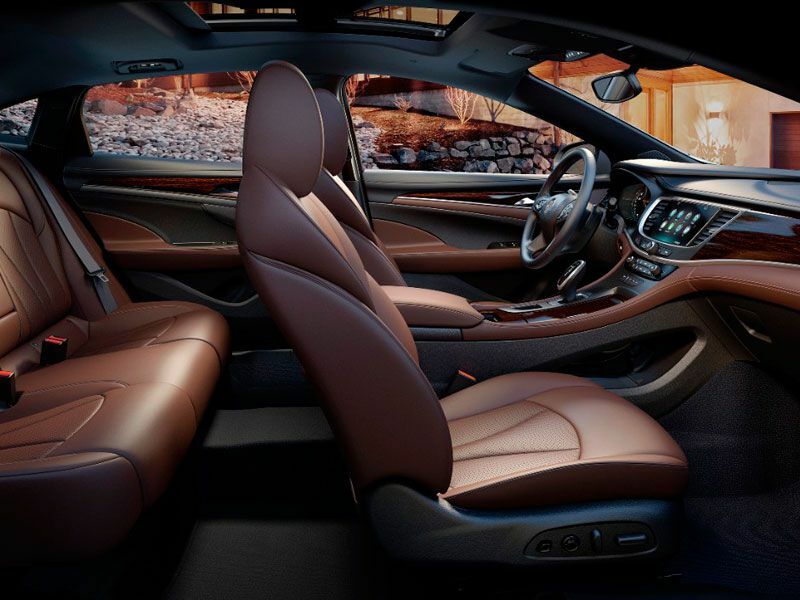 Even in the base 1SV trim level, LaCrosse offers a modern cabin reminiscent of upscale European sport sedans. The layout is clean, with enough knobs and buttons to make critical functions easy to access, but not so many that the flow of the design is interrupted. The seats in the LaCrosse are comfortable, trimmed in leatherette vinyl at the low end of the trim options, but real leather starts in the mid-level Essence trim. 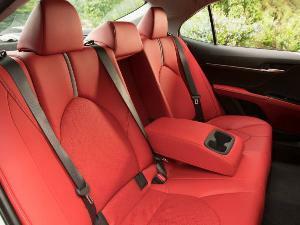 You can get heat, ventilation, and massage in the seats, and a heated steering wheel. All LaCrosse trim levels feature active noise cancellation and a well-insulated cabin, yielding a peaceful and quiet driving experience. 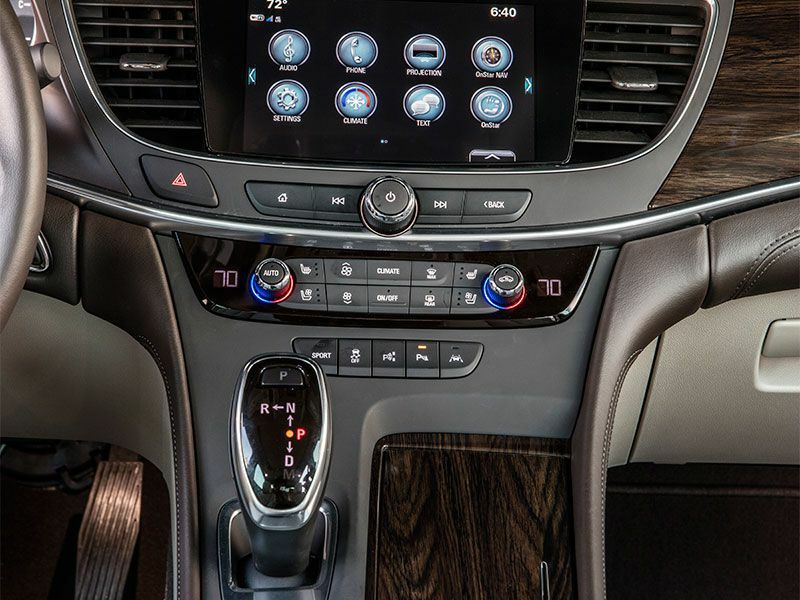 Buick puts an 8-inch touchscreen interface into every LaCrosse, with support for Apple CarPlay and Android Auto. That means if you have a smartphone, you also have navigation and familiar apps on your dashboard. If you opt for Essence trim or higher, you can also buy the upgraded infotainment system with an 11-speaker Bose audio system and built-in navigation for an extra $1,145. 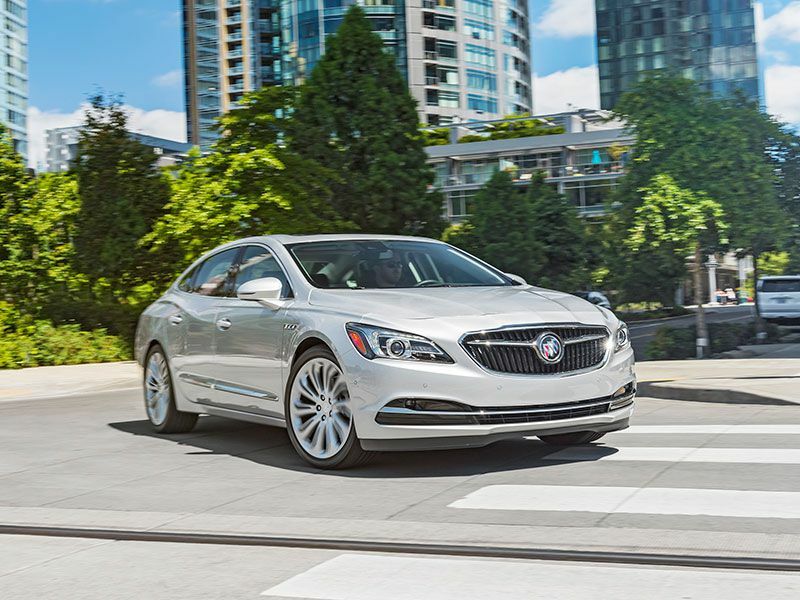 If you buy up to the Premium or Avenir trims, Buick’s Driver Confidence Package #2 priced at $1,690 will automatically parallel or perpendicular park the LaCrosse for you. This package also includes full speed range adaptive cruise control. LaCrosse has received excellent safety evaluations, earning five stars across the board from NHTSA. Except for the headlights, the LaCrosse also received top marks from the Insurance Institute for Highway Safety. Optional safety features are grouped into reasonably affordable packages, such as the $445 Driver Confidence Package #1 with blind spot monitoring and rear cross-traffic alert. As mentioned, Driver Confidence Package #2 costs $1,690, but includes full speed range adaptive cruise control, automatic parking, forward automatic braking and pedestrian detection and braking. Note that this package is available only on Premium and Avenir trims. Driving the LaCrosse is generally a very pleasant and relaxing experience. The 2.5-liter base engine with eAssist offers adequate power for most purposes. Regardless of trim level, the LaCrosse is smooth and well-mannered, and the active noise cancellation really keeps road noise to a minimum. Performance enthusiasts will want to upgrade to the V6, and perhaps the Dynamic Drive Package, offered for $1,625 on Essence and higher trims. This package buys 20-inch sport wheels, real-time continuously variable suspension damping, and on front-wheel-drive cars, includes an upgraded high-performance front suspension system. Dynamic Drive also includes a sport driving mode, which sharpens up the car’s responses somewhat. The LaCrosse will never be a sports car, but it is an enjoyable touring car. The closest competitors to the LaCrosse right now are the V6-powered Chrysler 300 and Ford Taurus. The Chrysler offers comparable luxury and sticker price but is much less expensive right now due to drastic manufacturer incentives. 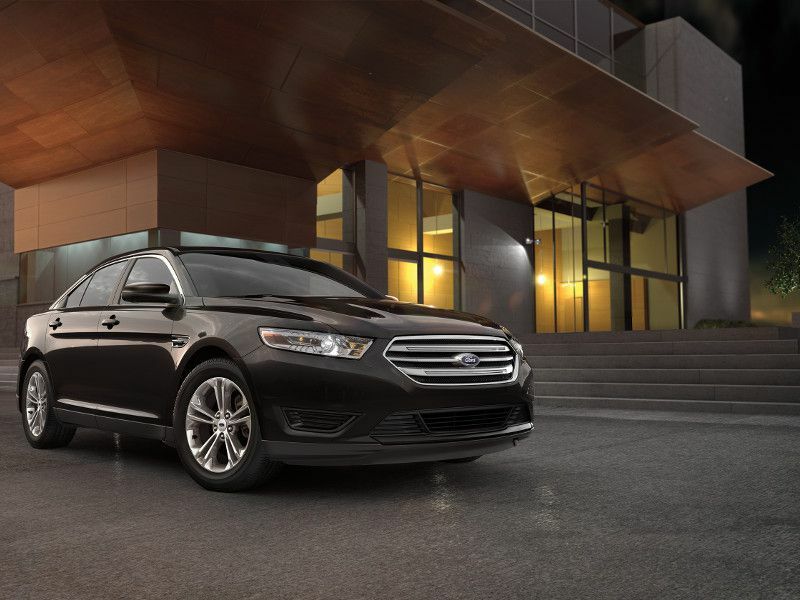 Ford is also offering large incentives on the Taurus this year. Competing vehicles like the Toyota Avalon, Kia Cadenza, and Nissan Maxima all start over $2,000 higher than LaCrosse. However, at the high end, those vehicles are less expensive than the Buick. The Dodge Charger is almost the same base price as the LaCrosse and starts with a V6 engine, but the Charger is in no way a luxury car. Same with the Chevy Impala, which starts at $28,770 before incentives, but offers a much less refined experience. Buick has made “attainable luxury” the central promise of its brand, and that is certainly the case with LaCrosse. 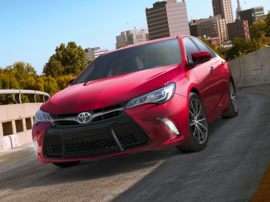 This sedan bridges the gap between economy pricing and the premium features and design you expect from a luxury brand. That’s why we think it’s worth splurging on this model. If we were buying the 2018 LaCrosse, we’d go big on the trim and features. All-wheel-drive is great for resale value, as is the V6 engine. Really, the difference in fuel economy is small compared to the difference in performance. Choosing the volume model from the middle of the price walk, the LaCrosse Essence comes with heated leather seats, V6 engine, 9-speed transmission, and AWD for a sticker price of $41,995. We would add the Driver Confidence Package and the Sights and Sounds package to get the Bose upgrade sound system, navigation, and the blind spot and rear cross traffic alert features, bringing the total price to $43,585.